Home events Extreme Park Friendship fun NuffNang orange Paintball pink rock climbing samsung Corby SFC Sunway Lagoon teamwork Tug-o-war white yellow Samsung Corby - Color Me Carnival! First and foremost, "THANK YOU SAMSUNG & NUFFNANG!" I was shortlisted to be here and this my first and more amazing event that I had fun at. Although I kept to myself most times (super shy) I still made new friends along the way and there's just so much more than just fun & games! 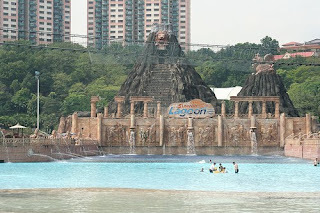 Once we're in Sunway Lagoon Extreme Park, we headed off to grab some seats and our favourite (my favourite!) "Emcee of the Day - Liang" started off with an exciting welcome and our very own Samsung Malaysia Electronics (SME) Sdn. Bhd. 's Marketing Manager, Mr. Sam Chen gave his first speech to kick-start the event! Our 1st game! 18sg.... Not for the faint-hearted....... Called "Stomp The Yard"
The 2nd game! 18sx.... Try not to get wet or wear extra cover ups later.... Called "Tug-O-War"
The goal is not to slip and fall or vice versa! Pull the rope and win! Simple but tough... It's in the water!!! The 3rd game! "Rock Climbing"... It is nooooooooottt easy! At first, the goal is to grab as much balloons as we can (same color as team color) one team member at a time. It become almost like a handicapped match... Pink and Yellow's rock climbing walls were tougher than Orange and White...Because of this, our kind-hearted Samsung Event guy (sorry don't know the name), gave us a chance to replay the game and this time, climb anywhere we want but make sure we touch the top and shout 'Corby' before we come back down! Very strong moral booster from each teams! Not much teamwork seen here except for extra motivations and supporters shouting at their teammates to climb, climb and climb! The 4th and Final game! 18sg... Yes, brutal... "Paintball"
The goal, each team split into 2 teams of 5 members. Each team against the others must get the flag in the center without getting hit; Before, During & After - getting the flag!.... I must admit, very very tough but worth the experience! We had permission to play anything we want at Sunway Lagoon Extreme Park because we have the tags around our wrists. But I had to go back and I want a shower soooo bad! Plus, I had my fun and I'm remembering it my entire life! Finally, a great big warm wonderful THANK YOU to Samsung, Samsung Fun Club, Nuffnang, Nuffnangers (you-know-who-you-are), bloggers and everyone at the event. Conclusion : Pink team probably got 3rd or 4th place but who cares! Everyone's a winner today! Look at the goodies they gave us already! Plus, we've gained friends we've never met before (I know I did) isn't that the best gift money can't buy?! Priceless!... See ya soon ! waa..so jealous! i got email from samsung too! and yesterday joaan called me for the reconfirmation. since i'm in langkawi, no chance la to go..sedih. anyway, i can see you have so much fun there. anyway, can i link to this post on one of my entry later for this carnival? Haha. A very quick post! I was in the white team. And yeah, at the end of the day, we were all meeting new friends and had some fun somehow! yup! i had so much fun there!!! sabrina...hye, its me suria. we met that day.. nice meeting u..